Being added as of patch 2.4.3, along with a small "fix" that will have non-combat pets that fly higher up in altitude as opposed to skimming the ground. Looks exactly like a shrunken down Nether Ray. As for why it's called a "Nether Ray Fry", I'm guessing maybe the dev in charge of names was hungry. "Fry" is a term usually used to describe a newly hatched fish. I guess they didn't like the name "Newly Hatched Nether Ray" (although I'm not sure what a nether ray has to do with a fish). When you summon your mount, in the split-second before your Hunter pet despawns, you could take a picture of yourself with four glorious Nether Rays at your command. Check out http://static.mmo-champion.com/mmoc/images/news/2008/june/netherrayfry.jpg for a close-up on the pet, amatheiva. hmm, not able to find it at either base on live, is this actually been continued into live version? Get this with a Skyguard mount, you'll match very nicely. For people who love collecting minipets, his will be a nice bonus. Also very nice for those of us that already grinded out the rep, it's nice to see them continue to add rewards retroactively to reputations. I don't see why you consider Nether Rays insects. All of them are classified as Beast, and many are tameable, including Count Ungula. If I'm wrong, please correct me. 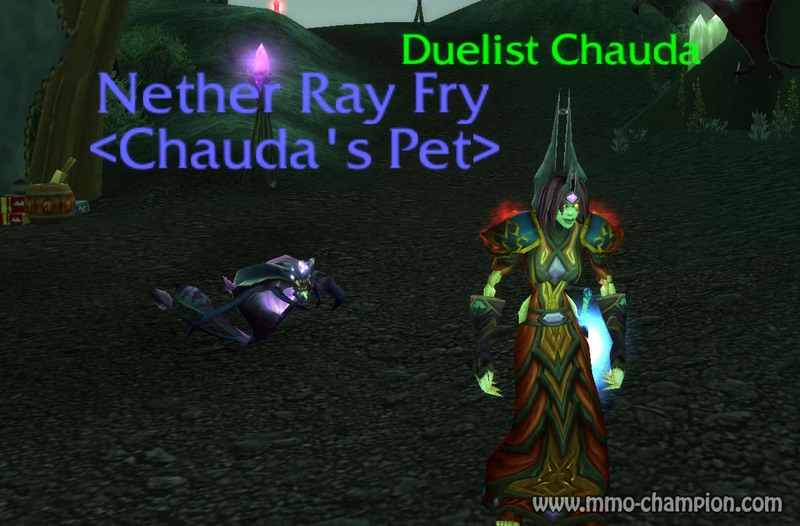 Confirmed, the Nether Ray Fry is available from the Sha'tari Skyguard Quartermaster in Terrokar. At max rep it was 32g. The pet animation is the same as the mount and NPC, coloration looks like a Blue Nether Ray mount. Quick facts on here are wrong. The item is 32 gold that's when you're Sha'tari Skyguard - Exalted and sells to the vendor for 2 gold. He's working on lowering the cholesterol level in whales... all that blubber, quite unhealthy. You know it's the largest mammal on earth but as George says, "they don't have to be." if your a hunter there is another reason to get this little guy. as Windserpent pointed out, you can have 4 of them at one time, but to be more realistic, the caged nether ray would have been spent for the rep. it is very hard to take a picture in that split second where your mount and pet are still active. buuut, have the fry out with the hunter nether ray (maybe even give the fry a pet biscut :P) then when you mount your riding ray, it will look a bit like your mounting your pet, its fun! - DOES follow you up in the air when you fly. - Looks like a mini purple nether ray. - Does not despawn when you zone or log off. Silly persons! Small Fry has been used for decades if not longer, as a term even for a small child. Probably giving away a trade secret here, but...! If you have the rep, you can buy multiples of these from the Skyguard vendor, learn them (only three at a time, since that's the duplicate pet limit) then cage them and sell them on the auction house. It's a pretty nice little income, and one more reason to thank yourself for doing the grind to Exalted. You can buy this by having exalted reputation with this faction. Apparently Maaria, Sha'tari Defense Quartermaster, located in the Trading Post, is ALSO selling this. They have recycled a pet, where you only need to be revered to get.. Though it costs more buying it from her, seeing as 2000 Apexis Crystals are a good amount. I am not sure if they have done a mistake here, and have added the old fry into the game.. and not the new one. I can't find any information about the NPC who sells Sky Fry, the new Netherling that is supposed to be in the game. I will contact Blizzard about this, and update information!